During the early 20th century, Betul was known as Badnur. It derives its present name from its surrounding district, which was named for its former headquarters at Betul Bazar, a small town about 5 km (3 mi) to its south. Betul—literally "without" (be) "cotton" (tool)—was named for its position outside the area's cottonfields. Nearby Kherla was formerly the seat of an independent kingdom in the medieval and early modern period. Under Company Rule, its fort was permitted to fall into ruin. Badnur became the headquarters of Betul District in 1822. Surrounded by hills on all sides, it was used by the British for the exportation of coal. It supported two bazaars; the larger, Kothi Bazar, held 2015 people in the 1870s. At that time, the town had a circuit house, a dak bungalow, a caravanserai, jail, police station, pharmacy, and schools. Its population c. 1901 was 3766. Following independence, Betul lay near the geographical center point of the new country, which is now marked by a stone at Barsali. Betul was connected to the Delhi–Chennai line of the Indian rail network in the early 1950s. It now serves as a junction point, providing the only access to the Chindwara District on broad-gauge rail. Betul is located at 21.92°N 77.9°E﻿ / 21.92; 77.9, near the geographical center point of modern India. It has an average elevation of 658 m (2,159 ft). During the 2011 Indian census, Betul had a population of 103,330. Males constitute 52% of the population, females 48%. Betul has an average literacy rate of 76%, higher than the national average of 59.5%. 13% of the population is under 6 years of age. Betul District's economy is predominantly an agrarian one. Its dense woods also permit forestry. Its road and rail connections and good telecom services have led some to predict that Betul will become an advanced industrial district. M/s. Wearwell Tyre & Tube Industries, Panka, Amla (305.27 Lakhs). 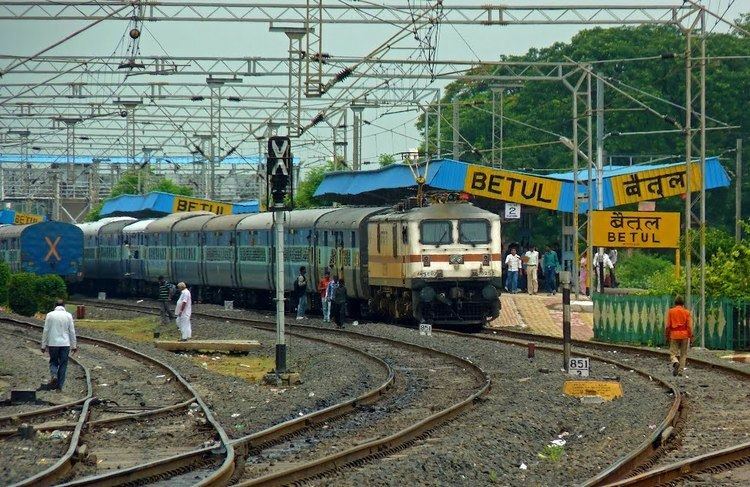 Betul is connected to the broad-gauge Delhi–Chennai (Grand Trunk) line of the Indian rail network, which also communicates with Bhopal and Nagpur. About 45 routes connect to major cities including New Delhi, Chennai, Banglore, Hyderabad, Bhopal, Nagpur, and other cities. Betul is serviced by National Highway 49, also connecting it with Bhopal and Nagpur. National Highway 59 connects it to Indore as well. There are daily buses to Bhopal, Nagpur, and Indore, as well as Jabalpur, Hoshangabad, and other cities. Betul's RTO code is MP48. The nearest airports are at Nagpur and Bhopal, about 180 km (112 mi) away. The tyre industry also uses the area's waterways for export to the United States, the UK, the Middle East, and Africa. Vivek Ji established 9 March as Poet Day (Kavi Diwas) in Betul in 2012. Each year since, the city has celebrated the festival with poets coming from across India to recite their work. Muktagiri is scenic Jain temple approximately 80 km (50 mi) from Betul. Balajipuram is a temple 8 km (5 mi) outside Betul built by NRI Mr Sam Verma. The temple was opened to the public in 2001. Every year Funfair is organized on the occasion of religious festival of Basant Panchami. This temple is 111 feet (34 m) high and covers 15 acres (6 ha). Kukrukhamla is a scenic spot. Multai is the origin of the Tapti River and a place of religious importance. It is situated on the Bhopal-Nagpur Highway about 50 km (31 mi) from Betul. Other tourist spots include Sona Ghati, Kerpani, and the Shapna Water Reservoir.